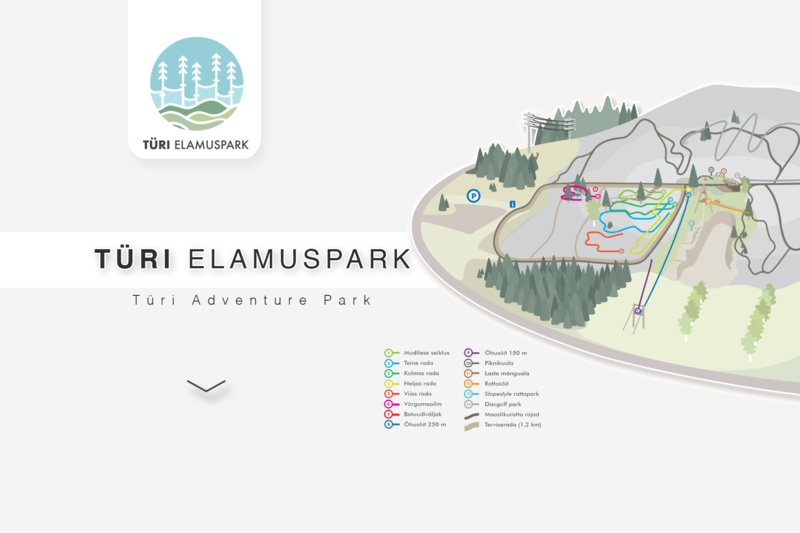 Using the slopes, cyclo cross and downhill trails, also health tracks at Türi Experience Park is free of charge for everybody provided you follow good habit. When coming to the park, be respectful to nature and take back everything that you have brought along. Driving any motorized vehicle is not allowed in the premises. It is forbidden to use the equipment of the Park without permission or without having purchased the ticket, also climb at the time when the Park is closed. Climbing the attractions without safety gear is a threat to life. Adventure Park is not free of charge. Every customer signs a contract in writing with the Park before going on the trail, gets safety gear and is provided with safety instructions. The fee covers a single trip on trails. After leaving the trail you should return the gear immediately. Maximum three people are allowed on the platform at a time, and one person at the game. Distrubing other visitors on trail or on the grounds is strictly forbidden. You should avoid jams and let a faster climber pass by. Passing the safety belt to the third persons is not allowed. Children under the age of 16 can access the trail only when supervised by an adult. Children who are between 120 -140 cm of height can access first three trails. Kuni 18 aastane nooruk, vähemalt 140 cm pikk, saab läbida kõik 5 rada ja õhusõidud. A person at least 18 years of age and 140 cm of height is allowed the access to all 5 trails and ziplines. After the visitor has dressed or been to the toilet, the instructor has to check their safety belt. Personal belongings can be left at the pavillion of the Park. You should dress according to the weather and not have loose footwear. You should be aware of mosquitoes – bring the repellent. If you need to remove the safety belt, e.g. for dressing, using toilet etc., the instructor should check it being fastened again. When being engaged in the attraction, make sure you are fastened to the safety rope at all times. Do not use the attractions at the time of lightning. Before starting the zipline, make sure the previous visitor has left the trail. When bringing a pet to the Park, make sure other visitors are safe. Keep your pet on a lead or use a muzzle, if needed. NB! Higher trails are accessible to individuals who are physically fit, at least 16 years of age and do not weigh over 100 kg. Respect nature: use footpaths and take back everything you have brought along. MANY THANKS! The Park has been designed in accordance with standards of European adventure parks. Visitor’s safety is provided by instructions of the staff and appropriate use of the safety gear on trails. An adult is responsible for the safety of an underage visitor throughout all stay in the Park. Instructors guide and observe visitors from the ground.